Agility is a competitive sport for dogs. It is an obstacle course made up of jumps, tunnels, and walkways. Dogs and handlers work as teams, with the handler helping the dog navigate the obstacles in the correct order. Some people do agility training just for fun, while others enjoy competing in agility trials. During the trials, dog and handler teams compete to see who can complete the obstacle course the fastest and with the fewest mistakes. Dogs usually start competing in agility between the ages of 1 and 2. Puppies and young dogs may injure themselves by jumping hurdles. Talk to your veterinarian to figure out when your dog will be ready to attempt the jumps. You can start training your dog before they're of age to compete. Begin by working on basic obedience and teach your puppy to sit, lie down, come, heel, and stay. Your puppy will also benefit from attending training classes where they will learn basic obedience and get used to working around lots of other dogs and people. Once your dog is ready to start agility training, your best bet is to find a class or group in your area. The United States Dog Agility Association (USDAA) offers a directory for agility groups in each state, and many dog trainers offer classes as well. In the classes, you will be able to introduce your dog to the obstacles without the expense of buying or building them yourself. There are several contact obstacles, including the A-frame, the teeter-totter, and the dog walk. The A-frame is a cone-shaped walkway. Dogs must be able to walk up the steep incline and back down the other side. The dog walk works like a balance beam for dogs with ramps on either end. The teeter-totter is just like the one you would find at the playground. Your dog must learn to walk across it as the board moves under its weight. These obstacles are called contact obstacles because there are specific spots on one or both sides which your dog must touch with at least one paw. You can teach your dog to make this contact by leaving treats on the contact zone; your dog will get the treats only by putting its paw there. Be sure to practice this as you teach each obstacle. When you begin, make sure the obstacles are moved to the lowest position possible. Put your dog on a leash, and give a command specific to the obstacle, such as "A-frame." Move quickly as you approach the obstacle, and lead the dog over it. You may need to use some extra special treats the first few times to coax your dog onto these obstacles. If your dog absolutely refuses to get on, try training these obstacles in reverse. Pick up your dog and place it at the end of the obstacle. Usually, dogs will take the step or two it takes to get off. Once comfortable with this, you can move your dog a little further up so it has to take a few more steps to get off. Keep things positive and upbeat. Once your dog gets the hang of the contact obstacles, it will be eager to do them again and again. Once your vet says it is OK, you can get started on jumps. Do not start off too high. For large and medium breed dogs, keep the bar 1 or 2 inches off the ground. For smaller breeds, you can start with the bar on the ground. Teach the jump by keeping your dog on the leash so it cannot go around a hurdle. Give a command specific to each jump, such as "big jump." Approach the jump briskly, and in most cases, your dog will hop over the hurdle. Give lots of treats and praise. As your dog gains confidence, you can gradually raise the height of the jumps. If your dog is refusing to go over a hurdle, practice in a narrow hallway. Set up a small jump and put your dog on one side with you on the other. Your dog should have nowhere to go but forward over the jump. Encourage your pup with treats and a happy tone of voice. With a little patience and positive reinforcement, your dog will soon be a confident jumper. Once your dog has learned the basics, it's time to begin teaching agility specifics. Tunnels are usually an easy obstacle to teach. Start off with a short tunnel that allows your dog to see through to the other side. Have someone at the opposite end ready with some treats or a favorite toy. Lead your dog to the tunnel, give the command "tunnel," and have your helper begin calling it and offering treats. If your dog is hesitant, you can throw a few treats inside. Most dogs will quickly make their way through to the other side. As your dog becomes comfortable, you can work up to longer and curved tunnels. Weave poles are a row of poles that your dog must weave in and out of. This can be a difficult obstacle to teach. Plan on lots of practice and repetition before your dog masters this skill. To start, stagger the poles so they are at least shoulder-width apart for your dog. Put on a leash and lead the dog through the middle channel between the poles. After you have done this a number of times, gradually move the poles closer to the center. This forces your dog to bend its body a bit to work its way through the middle channel. By the time you have the poles in the correct position, your dog should have learned the bending movement needed to weave around the poles. The weave poles can take several weeks to months for a dog to learn. The pause table is a table that your dog must jump up on to perform either a "sit-stay" or a "down-stay." The table is usually no higher than your couch, so it is not hard to encourage your dog to jump up on it. Patting the surface and using some treats to lure your dog is usually all that is needed. The tough part about this obstacle is keeping your dog in a stay. Most dogs are anxious to move on to another obstacle. This is where your early training comes in. 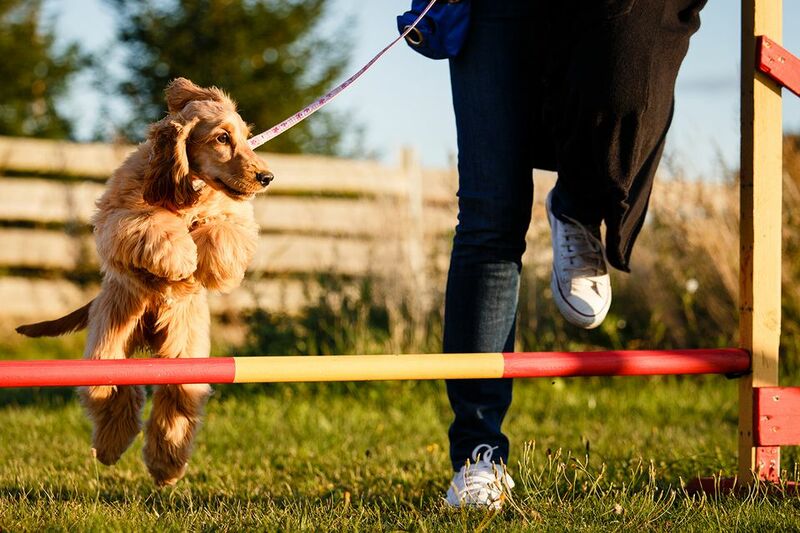 If you have practiced basic commands before you begin agility training, your dog will be ahead of the game. If your dog is having trouble, start small. Have it stay for a count of one, and then offer a treat. Gradually increase the amount of time you have the dog stay. Once it is able to stay for 5 seconds or more, practice with lots of distractions to mimic the experience at an agility trial. Once your dog has mastered all the obstacles, it's time to put it all together. This is called sequencing. It's your job to let your dog know the order in which it should approach obstacles. Start by linking two obstacles, such as a jump and the tunnel. First, give your dog the command "big jump." Then, before it hits the ground on the other side, say "tunnel" as you move toward the tunnel. Timing is important with sequencing. If you wait too long to give the command for the next obstacle, your dog may make the choice itself, and it may not be the right one. Once your dog has gotten the hang of doing two obstacles in a row, you can add another, and so on, until it is able to complete an entire course. Once it's able to do that successfully, you are ready to compete. According to the USDAA, there are over 150 breeds of dogs, including mixed-breed dogs, involved in agility. Some breeds, like the Australian Shepherd, are known for excelling at the sport. However, you should not let the fact that you have a Golden Retriever or a mixed-breed dog stop you from trying it. If your dog is playful and energetic, it will probably enjoy agility training. If you work on agility training at home, your backyard is likely a controlled environment with very few distractions. This can make going to a competition difficult because your dog is not used to the hectic environment. It's a good idea to proof your dog's training in different locations to prepare it for distractions. Invite a few friends over to cheer on your dog so it gets used to a crowd. You might also want to go to a training center or find local trainers who also have the obstacles set up in their backyard. If your obstacles are portable, you could even take them to a park. Keep in mind that your dog may not enjoy competing. Running the obstacles at home may have to be enough, no matter how much your heart is set on having a winning pup. If yours isn't the show off on a big stage type, simply take joy in the bonding experience that agility training offers you and your dog. Have fun with it and your dog will too.